The “P” in this speaker’s name could stand for three things: personal, portable, and powerful. Designed by legendary Danish audio brand Bang & Olufsen, it offers rich, powerful sound in a compact, 5.5″ x 3″ package. It connects wirelessly to any Bluetooth device and offers integrated, intuitive controls: Just tap the face or shake the speaker to control playback, skip songs, accept calls, and access voice assistant on your mobile device. A splash- and dust-resistant case and leather wrist strap makes it ready to fill any space with sound, indoors or out. 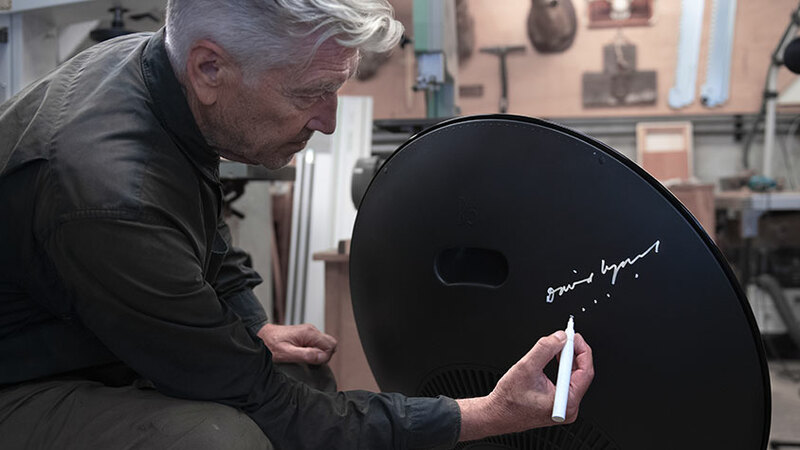 This speaker features special edition packaging and cover with artwork by David Lynch, with his signature printed on the underside of P2. Bang & Olufsen was featured in MoMA’s 1978 exhibition Bang & Olufsen: Design for Sound by Jakob Jensen. • USB-C rechargeable battery for up to 10 hours of play time. • Built-in mic for calls and access to voice assistant. • Companion app for speaker customization. David Lynch is an American director, screenwriter, actor, artist and musician. He is known for such critically acclaimed films as Blue Velvet, The Elephant Man, Mulholland Drive and Inland Empire. His 1999 film The Straight Story is in MoMA's collection. He's received three Academy Award nominations and won France's César Award twice, as well as the Palme d'Or at the Cannes Film Festival. His TV series Twin Peaks from 1990-1 enjoys a large cult following and has established his reputation as the "first popular Surrealist." In 2017, Lynch hosted a screening of the complete third season of Twin Peaks at MoMA. As a musician, Lynch has recorded two solo albums: Crazy Clown Time (2011) and The Big Dream (2013). Lynch is also trained as a painter and continues to produce painting and lithographic works such as Paris Suite (2007).